The Lagos Fashion and Design Week (LFDW), scheduled to hold on Saturday 26th October 2013, is now open for entries for the Young Creative Entrepreneur (YCE) & Young Designer of the year (YD) Awards 2013. The YCE awards programme rewards the talent and initiative of young creative entrepreneurs. It reaches across the creative fashion industry recognizing the central role they play in the development of a competitive and sustainable creative economy. The British Council and LFDW have identified the need to identify such talents and provide them with the right networking abilities to further expose their business to the much needed prominence and simultaneously grow the Nigerian fashion industry. 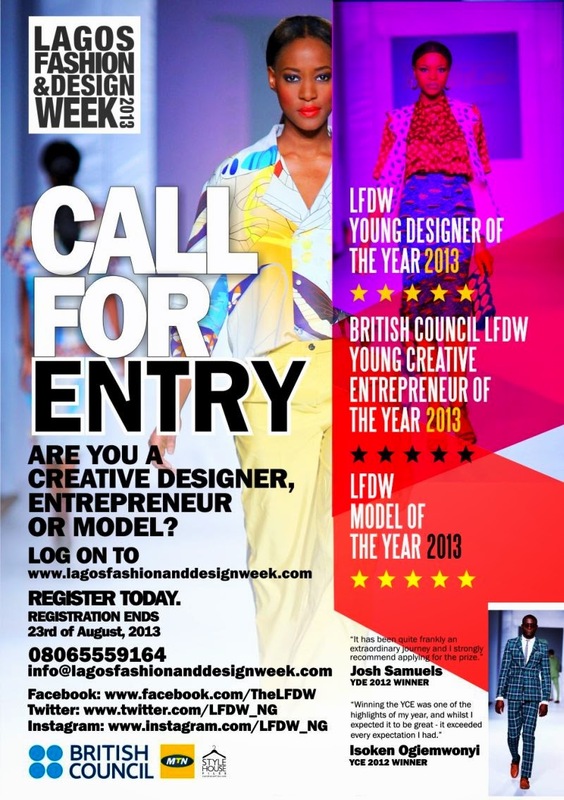 10 – 12 young designers are usually shortlisted for LFDW. These individuals are trained in Master Classes by British Council for a week to enhance their design skills towards their competition during Lagos Fashion & Design Week, where one designer will be crowned the winner. Past winners include Isoken Ogiemwonyi (CO – CEO of Retail Store, L’Espace) for the Young Creative Entrepreneur Award and Josh Samuels for Young Designer of the Year Award. ·The winner of the Fashion award will be invited to take part in a tour of the industry in the UK.